20th-century Nazism joining forces with 21st-century Islam-based Nazism. Perfect. Holocaust denier and former KKK leader David Duke offers support for Ilhan Omar, demands Israel pay for Trump’s border wall. 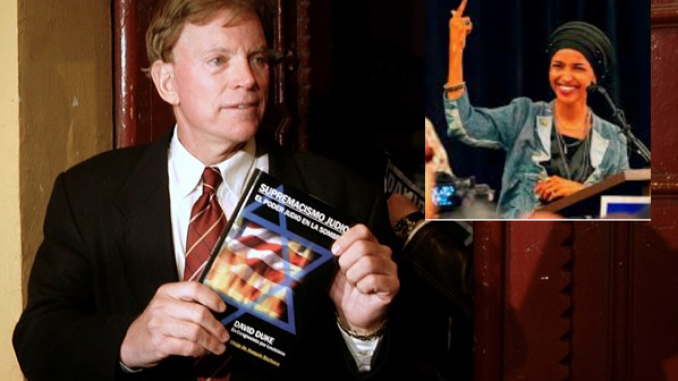 Former Ku Klux Klan Grand Wizard and Holocaust denier David Duke excoriated President Donald Trump for calling on Minnesota Congresswoman Ilhan Omar to resign in her latest scandal involving anti-Semitism. Omar, a Somali-American freshman congresswoman representing the greater Minneapolis area, drew bipartisan condemnation this week after she accused the pro-Israel American Israel Political Action Committee (AIPAC) of bribing lawmakers to support Israel. 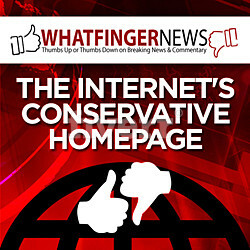 The latest scandal came on the heels of another controversy sparked after she told Yahoo! News that she found the idea of Israeli democracy laughable, and compared the Jewish state to the Iranian regime. In the past, Omar has come under criticism for accusing Israel of ‘hypnotizing’ the world in a 2012 tweet. After Republican lawmakers blasted Omar, senior congressional Democrats condemned Omar’s comments – but let her retain her seat on the influential House Foreign Affairs Committee. Omar offered an apology, while at the same time maintaining that AIPAC and other high-profile lobby groups have a “problematic role” in politics, comparing the pro-Israel group to the National Rifle Association and the oil industry lobby. On Tuesday, President Donald Trump denounced Omar, calling her apology “lame” and urging her to resign from Congress. But Omar did receive support from a fellow AIPAC critic – Holocaust denier and former KKK Grand Wizard David Duke. A former member of the Louisiana House of Representatives and perennial candidate for statewide office in Louisiana, Duke has endorsed race-based segregation and is author of the 2003 book “Jewish Supremacism”. Duke tweeted his support for Omar on Monday, denying Omar’s accusations that AIPAC bribes American lawmakers were in anyway anti-Semitic. Following President Trump’s condemnation of Omar, Duke excoriated the president, accusing him of promoting an “Israel first” agenda, and the conversion of Trump’s daughter, Invanka, to Judaism and her marriage to a Jewish man. “Israel has hypnotized the world, may God awaken the people and help them see the evil doings of Israel,” Duke added, drawing from Omar’s controversial November 2012 tweet. Duke also called on the president to force Israel to pay for the border wall with Mexico. On Wednesday, Duke posted a picture of Ivanka Trump and Chelsea Clinton alluding to the fact that both are married to Jews, a fact he described as “collusion”. Despite his initial backing for Omar, and his criticism of President Trump’s call for her to resign, Duke blasted Breitbart News after it published a story entitled “Former KKK Grand Wizard David Duke Backs Democrat Ilhan Omar”.